FWBFD members on A-Shift were able to render Advanced Life Support care upon first response and produce a positive outcome for an elderly woman. Rapid response and proper training took the pt. from full cardiac arrest to breathing on their own by the time EMS arrived to the E.R. Saves come in all forms and fashions, be ready! Crews were dispatched to the 1900 block of Washington South Drive at 1:15 p.m. on reports of a building fire. Once on scene, they found heavy black smoke pouring from an attic area of a unit of four condos. No life-threatening injuries were reported in the fire that officials say affected at least ten of the complex’s twelve units. Responders pulled one woman off of a second floor balcony and one man from a stairwell during the initial response, they were both taken to area hospitals. The little boy, who is seen being rescued in the video, was one of five people saved from the blaze, which happened in an apartment block in the town of Lawrenceburg, Tennesse. Firefighters can then be heard shouting, “drop the kid, drop the kid!” up to a balcony, as a young child is held out to them. The fire is believed to have started from a lit cigarette which had been discarded. Only one person is reported to have gone to hospital for smoke inhalation. JACKSONVILLE, Fla. — From the top of a 40-foot-tall, 18-foot-wide tank, rescuers spotted a man, trapped in tar Friday. Wilson said the conditions his team faced were beyond anything they’ve ever seen before. Wilson said the asphalt storage tank is heated by coils, which had been turned off by asphalt plant employees so the man could perform maintenance inside the tank. He thought the asphalt had hardened enough to step on, but instead, like quick-sand, the highly flammable tar sucked him in, and continued to harden around him. The man, Wilson said, remained calm in terrifying conditions. He was given a mask and rescuers pumped oxygen into the tank so he could breathe. They also covered him with a cooling vest and countless 10-pound bags of ice. Shovels were used to dig through the tar through a 19-inch hole in the side of the tank. The department lost nearly $70,000 in equipment in the process. At one point, more than one-fifth of the entire department was called in to help including 13 fire engines, six fire chiefs, five rescue units, six ladders, 12 specialty units, and 100 firefighters. Wilson said the department called in many off-duty officers to help back-fill stations so the city was properly staffed if there had been another emergency. 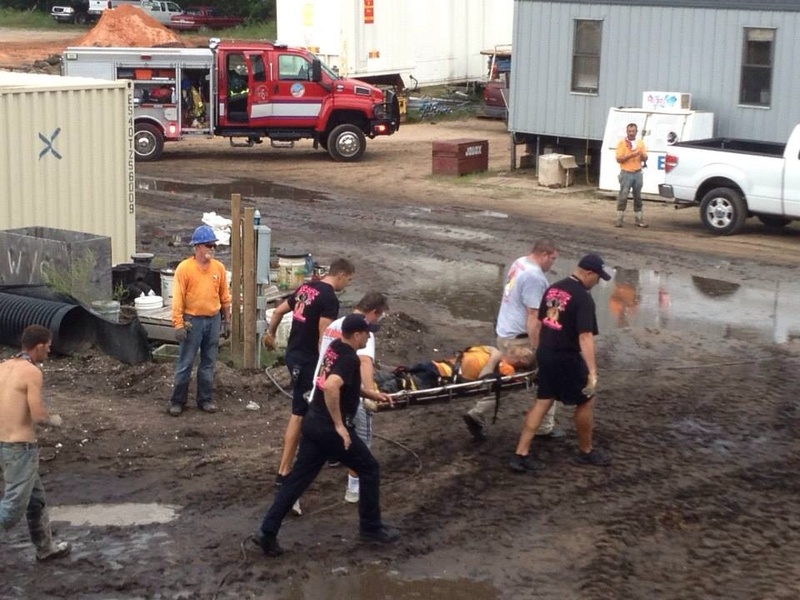 Fort Walton Beach- A construction worker who suffered a medical emergency was rescued Tuesday afternoon from a tank at a pump station under construction near Robinwood Drive and Hollywood Boulevard, according to Ocean City-Wright firefighters. Rescuers were called to the scene about 3:30 p.m., according to a news release from the Ocean City-Wright Fire Department. Fort Walton Beach firefighters climbed about 30 feet down a ladder to reach the unconscious victim and render ALS care. Ocean City-Wright and Fort Walton Beach firefighters and members of the Okaloosa County Special Operations Unit built a rescue system and a backup unit using rope, pulleys and other hardware. 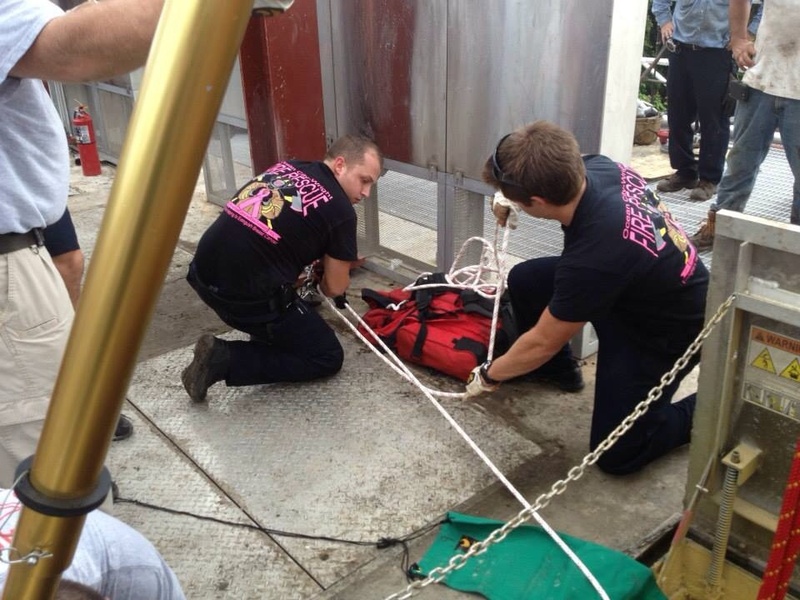 The system was assembled 35 minutes after the Special Operations Unit arrived and the victim was hoisted in a rescue basket from the tank. The patient, who was conscious by then, was taken to Fort Walton Beach Medical Center. Published: Tuesday, September 24, 2013 at 21:27 PM. 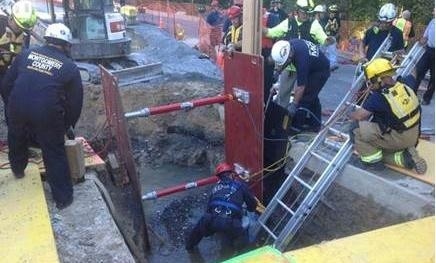 A 49-year-old Pennsylvania man working on a municipal water main project in Frederick County Tuesday afternoon had to be rescued after being trapped by several feet of muddy water under Eaglehead Drive. “He was trapped up to his neck and was starting to have difficulty breathing when crews quickly arrived and began their rescue,” says Frederick County Fire Chief Denise Pouget. Teams of rescuers from Frederick, Montgomery and Howard counties all came together to save the man who was working on a 12-inch water main in the Lake Linganore section of Frederick Co. when the pipe ruptured. 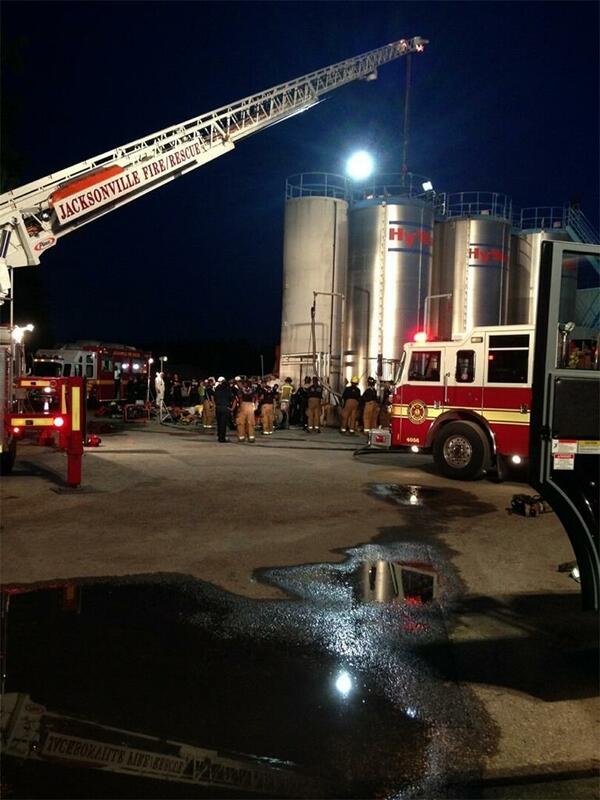 “And the water started rushing in around the worker,” Chief Pouget says. “And the walls around the ditch, the mud walls, if you will, and stones started coming in on the worker.” Chief Pouget says crews had to get the water turned off which she says took about 20 minutes. They used large metal plates to keep the trench from collapsing. “It was a very tricky, very delicate rescue and a methodical process,” says Pouget. One of their biggest challenges was not making matters worse than they already were. 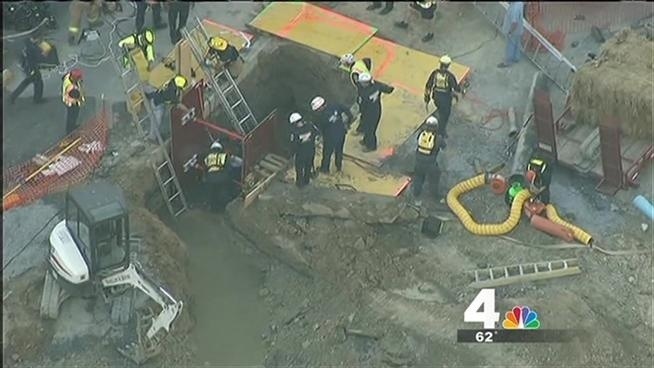 “He was in this hole, struggling, for over three hours,” says the fire chief. The man was finally pulled to safety around 6 p.m. Tuesday and flown to Shock Trauma in Baltimore. “He is stable and he is on his way to the hospital,” Chief Pouget tells us. “Very tired.” Frederick County Sheriff’s investigators are now conferring with Maryland Occupational Safety and Health officials to learn why this happened. The 65 rescue workers were meeting to talk about what they had just done, how their training paid off and what they might do differently next time. PLATTSBURGH — Climbing through the third-floor window of the burning eight-unit house, Firefighter Matt Barrett couldn’t see the woman he knew was there somewhere. To his huge relief, his gloved hand found her head. “Then I got down close to her face, and I could hear her breathing,” he said. Flames rolled through the thick black smoke in the apartment at 15 Couch St., and the City of Plattsburgh firefighter knew flashover was just a few minutes away. Below, firefighters Ryan Sponable and Mike Bonner kept hoses pointed at the room, buying precious time for Alexa Limato, who’d been leaning out of the window when the first city truck arrived. 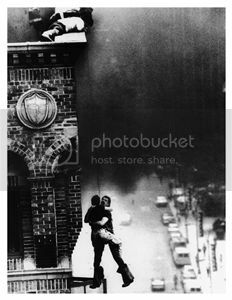 She’d seemed on the point of jumping, those first firefighters thought. They told her to hold on, that rescue was coming quickly. But by the time Barrett arrived on a second truck, just moments later, she had collapsed inside the apartment. Friday afternoon, Limato was at Clark Burn Center at Syracuse Upstate University Hospital, where she had been taken by helicopter from CVPH Medical Center in Plattsburgh. The SUNY Plattsburgh student, 21, was listed in serious condition there in early evening, an improvement from an earlier report that she was stable but critical. She was one of 11 tenants in the white, wood-frame apartment house owned by Thomas Latinville; one of them had smelled smoke and run through the building, pounding on doors, waking people up and alerting them to the danger, City Police Lt. Patrick Rascoe said. Giancarlo Pecora, 21, lived alone in a first-floor apartment at 15 Couch. He had been out downtown Thursday night and, walking home at around 1:45 a.m., saw the apartment building in flames. “It was just ablaze,” he said Friday, about eight hours after the fire. Barrett and the other firefighters saw the people on the street; some were crying, even screaming. A fire doesn’t really roar, he said, but you can hear its movement, a crackling sound. But you block it all out, though, working as a team to bring control to the chaos, he said. Barrett climbed the ladder hastily thrown up against the front of the building, struggled through the window in his heavy turn-out gear and air pack. Limato, unconscious, lay a few feet from the window. “I got her head out the window as quickly as I could,” he said, so she could breathe some cleaner air, away from the carbon monoxide and cyanide building up in the room. Barrett hollered down to Capt. Scott Lawliss for help, for the first ladder wasn’t quite tall enough to maneuver himself onto it while holding Limato. And he couldn’t risk dropping her the 30 feet to the ground. Firefighter Mark Lawliss and Chris DeAngelo got the taller ladder in place, Eric Recore climbed it, and Barrett lifted Limato down to him. Then he moved blindly around the space, which he thought perhaps was a kitchen, checking for other victims and finding none. The super-heated air in the room had to be at least 110 degrees, he said, capable of causing burns without flames. As Barrett reached the ground, he saw City Police Officer Richard Tucker trying to resuscitate a puppy. City firefighters and others from Plattsburgh District 3 and South Plattsburgh Volunteer Fire Department were attacking the flames. Barrett, Recore and Scott Barshow mounted the fire escape, carrying a hand line into the room at the top. On the ground again, the combined effort of all the firefighters knocked down the flames in maybe 15 minutes, he said. The mutual aid made the difference, he said, as did everyone working together. “Everything we do is a team effort,” he said. City Building Inspector Joseph McMahon, at the property Friday morning, said that the home was inspected nine months ago, and it did have the required smoke alarms. “But it is not uncommon for tenants to disable smoke alarms on their own,” he said. While the building remained standing, it suffered extensive fire, smoke and water damage. At least one dog died in the fire, Rascoe said, but several other animals made it to safety. Tucker’s efforts proved successful; the puppy he worked over began breathing again and was taken to a local veterinarian. Pecora, a college student from Westchester County, was worried about his dog, Bernie, and cat, Stink, as well as his belongings. Firefighters were able to rescue his pup; Stink was missing for about two hours but at last showed up. But most of Pecora’s other stuff was destroyed. 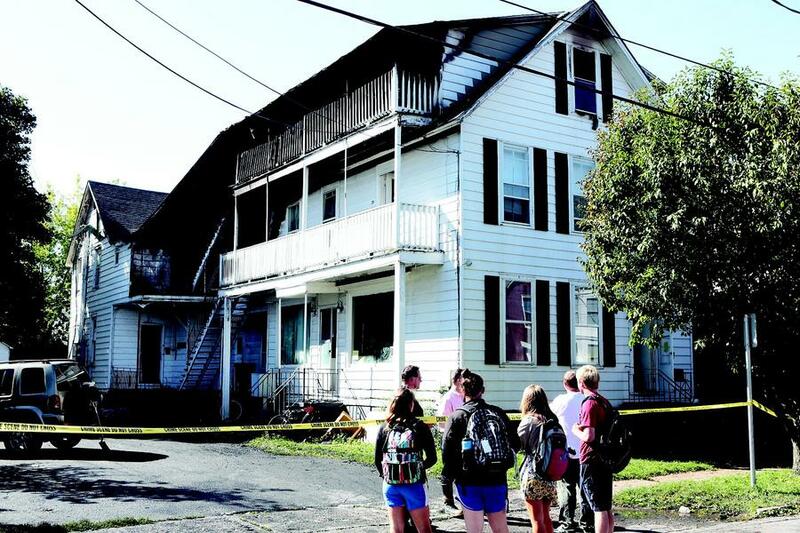 Both SUNY Plattsburgh and the North Country Chapter of the American Red Cross were assisting the students and local residents who lived at 15 Couch with temporary housing and other needs. City Police detectives determined the fire’s cause to be accidental, that it started in the electrical wiring of one of the second-floor apartments. Firefighters kept a fire watch at the property on Friday, in case it flared again; the main force headed back to stations between 6:30 and 7 a.m.
Barrett, a firefighter with the City Department for about five years, has entered a lot of burning buildings. “Luckily, everybody’s been out of the house,” he said. Having a part in rescuing Limato left Barrett feeling good, but very anxious as well. Madison Fire Department paramedics rescued a man from a dump truck Thursday morning. The man had been sleeping in a dumpster in the 2900 block of E. Washington Ave. when a garbage truck came and emptied it into the hopper. The man fell 8 to 10 feet into the truck. The driver heard him yell, and called 911. Paramedics and firefighters were able to climb into the hopper to get to the patient. 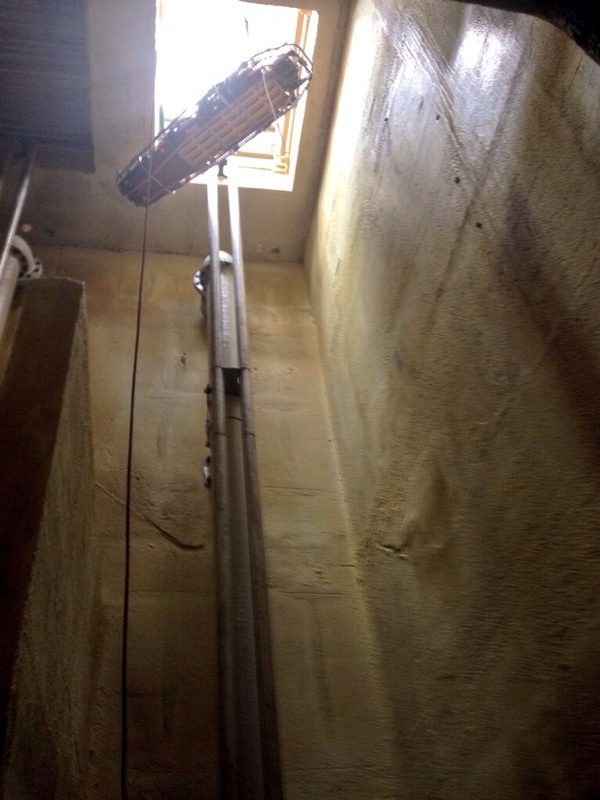 The man was rescued using a ladder and stokes basket. He was taken to UW Hospital with non-life threatening injuries. Friday afternoon Engine 5 answered a walk up at the firehouse. The woman pointed to a box truck across the street that had ran into a light pole. With the help of some bystanders, who had seen the whole event unfold, the members of Engine 5 removed the man from the truck and quickly discovered he had suffered a severe medical emergency and needed CPR. Firefighters started performing medical care and attached the AED. After several minutes Rural/Metro arrived, the paramedic quickly joined Engine 5 and started performing advanced level EMS care. After several minutes of care, the patient regained a pulse and even was able to answer some questions. Rural/Metro transported the patient to Strong, with a firefighter on board to assist in providing EMS. Emergency crews spent about two hours rescuing a cyclist who plunged nearly 20 metres from the escarpment near the Ancaster Mill restaurant. The 20-year-old woman went over the edge Wednesday morning near Canterbury Falls. It’s not known why she plunged down the embankment, but there are no curbs or barriers in the stretch of Old Dundas Road where she was biking, and the embankment is just a step or two from the road in some spots. Dozens of firefighters performed a high-angle rope rescue beginning shortly after noon. Emergency crews including two ambulances and seven fire trucks were involved. 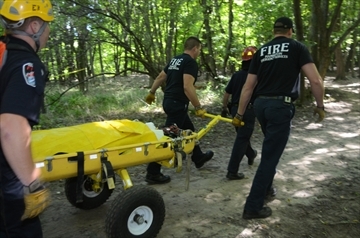 The woman was airlifted by Ornge air ambulance to hospital about 2 p.m. It landed to pick her up in the parking lot of the nearby Mount Mary Christian Retreat Centre on Wilson Street. EMS manager Carmen D’Angelo said the woman had serious injuries and was being treated for trauma at Hamilton General Hospital. Old Dundas Road was closed to traffic at the restaurant during the rescue.